When artist Candy Chang painted the side of an abandoned building with chalkboard paint and asked her neighbors this question, she never expected it to become a worldwide phenomenon. 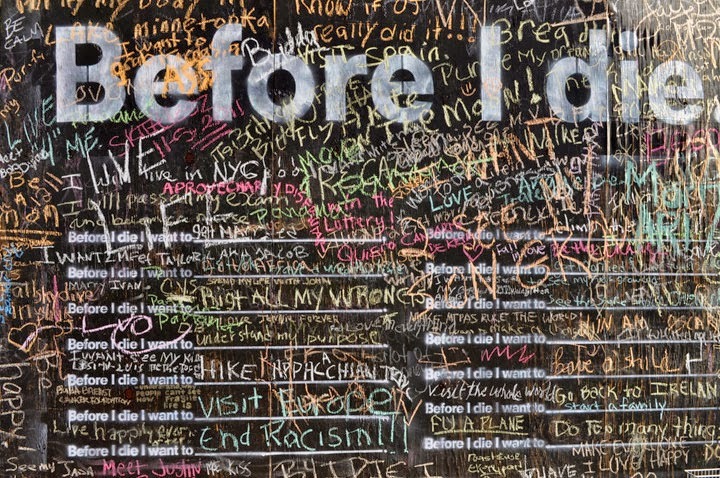 Within a day of the wall’s completion, however, it was covered in colorful chalk dreams as people stopped and reflected on their lives. Since then, more than two hundred walls have been created by people all over the world. This beautifully designed book is an inspiring celebration of these walls. Filled with our hopes, fears, humor, and heartbreak, it’s a reminder of our shared connections and a chance to ponder life’s ultimate question. Candy Chang is an artist that (I think at least) brings people together with her interactive projects. This project specifically started as something for the community (in New Orleans) and it has since spread world wide. Some of the things people wrote were funny, some were sad, and some inspiring. 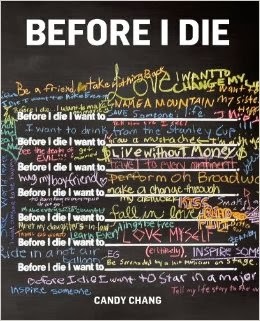 The book is filled with pictures and stories and, at the end of the book, it tells you how to make your own "Before I die" wall in your community. This is something that, with the help and resources, would be a great project for my town. While it's not the kind of book I typically read, it was a nice change and is something I'll probably leave on my coffee table and look at from time to time when I need some inspiration.